Clark Gable was a rugged man’s man, a high school dropout who worked his way to Hollywood and found the stature and fame that has eluded so many other hopefuls. Clark played down the rumour of his many affairs with the point that he wouldn’t have any time for fishing. There was certainly a lot of women in his life and his first two marriages appeared to be very convenient, for him that is. Both were much older and both paid towards acting lessons and grooming him towards the looks needed for a film star, and both ended in divorce. While married to his second wife and working opposite Loretta Young, an affair ensued that produced a child, though the girl was never publicly acknowledged. Clark obtained his second divorce and almost immediately married Carole Lombard. 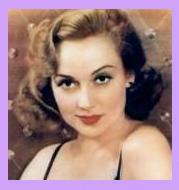 Carole Lombard was born at Fort Wayne, Indiana and christened Jane Alice Peters. Carole began in the silent era of film-making and unlike others, her voice was suited to the new sound accompanying movies, allowing her to continue to progress to comedy roles. One of the top box office stars was William Powell and on meeting they were married eight months later. However, the marriage did not last more than two years and during that time she had met and worked with the new King of Hollywood, Clark Gable. They began an affair and Carole divorced William but had to wait another six years for Clark to divorce his second wife who he really owed a lot to. Gable and Lombard went well together but only appeared in that one film, ‘No Man Of Her Own.’ Personally I am sceptical as to whether the marriage would have lasted as with many film star relationships crumbling under the pressure of career coming first, not forgetting Clark’s eye for the ladies. However, the marriage came to an end when Carole died in a plane crash in January 1942. Clark was devastated as she was the love of his life. Clark went on to marry Sylvia Ashley in 1949, she being the widow of Douglas Fairbanks who had died in 1939. The marriage ended in divorce in less than three years and a fifth marriage took place in 1955 to an old flame, Kathleen Williams Spreckles who had two children from a previous marriage. Although Clark’s health was failing, he was delighted when he found out he was going to be a father, this being a child he could hold up and declare his own. He began work on ‘The Misfits’ with Marilyn Monroe, who having declared her wish to work with Clark Gable, continued to follow her own schedule in turning up on set late. To fill in the time Clark did many of his own stunts which was partly put down to his demise. Weeks after completing the filming he suffered a heart attack and was rushed into hospital. His wife was 5-months pregnant when he succumbed to another heart attack and was pronounced dead on the 16th of November 1960. 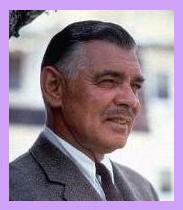 In March the following year his son was born and named John Clark Gable. 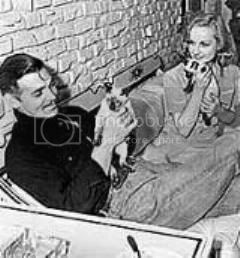 Clark Gable was interred alongside Carole Lombard 18-years after her death. The couple had only been married 34-months when Carole died. Having spent their first night of marriage in room 15 at the Oatman Hotel in Arizona, the couple returned to relive the memory and it appears that the staff still think the couple return in death. Another hotel where the couple stayed was the Roosevelt, a very popular place with the stars who are also said to return from time to time. Clark and Carole have had the suite they used named after them which has changed little since their stay. It was a relationship full of romance as Clark had the bath filled with rose petals for his bride. Last Will & Testament of Clark Gable.